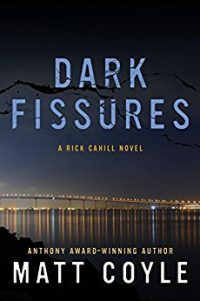 This third Rick Cahill dark thriller opened with him disgraced, and pulled over. Again. Cahill is an ex-cop, a hard-boiled character with a melty-soft center, especially for his dog, Midnight. He left the La Jolla Police Department in California under a cloud and Police Chief Tony Moretti has it in for him. Since he has to drive through La Jolla regularly to access his mailbox, Moretti has plenty of chances to target and harass him. Cahill was never charged with his wife’s murder, but he wasn’t cleared, either. He’s implicated in another twisted series of events that happened before the start of this book, but they follow him. He’s on the verge of losing his house when a beautiful woman drops a case into his lap. They meet at Muldoon’s Steakhouse, the place he calls his office, and Brianne Colton tells him she wants her husband’s supposed suicide investigated. They were separated, but he died in their house and was discovered by their son when he came home from school. Colton doesn’t think that’s what her husband would have done. The more Cahill looks into it, the more he agrees with her. Up to a point. Some strange things are going on with the band Colton plays in and he’s not sure of her. When he learns the man’s cell phone is missing, he knows he’s on the right track. He must face some of the members of the police force he’s been ousted from in order to get the details. If you like tight, fast, dark thrillers, you’ll do well to follow Coyle into the dark fissure that runs through Cahill’s soul. Be the first to comment on "“Dark Fissures” by Matt Coyle"